Apple has finally released most awaited iOS 10 Firmware, tvOS 10 Software and watchOS 3 update for iPhone 7 Plus, iPhone 7, iPhone 6S, iPhone 6S Plus, iPhone 6, iPhone 6 Plus, iPhone SE, iPhone 5S, iPhone 5C, iPhone 5, iPad Pro (12.9-inch / 9.7-inch), iPad Air 2, iPad Air, iPad 4th Generation, iPad Mini 4, iPad Mini 3, iPad Mini 2, iPod Touch 6th Generation, Apple TV 4 and Apple Watch devices at Worldwide Developer Conference (WWDC) 2016. Which means the latest iOS 10.3.3 Beta (Build: 14G5057a), tvOS 10.2.2 Beta (Build: 14W5751b), and watchOS 3.2.3 Beta (Build: 14V5751a) is available for iOS developers and non-developers (general public users) to experience and test all new features and functionalities after upgradation for Free. The Direct Download Links of iOS 10.3.3 Beta IPSW / Restore Image / OTA Update Files are available below. Revamped Messages App with tapback, balloons, fireworks, confetti, invisible ink, new emojis bundled and lots more for all your special occasions and celebrations communication with Messages SDK availability to third-party app developers. More open Siri with Siri SDK and SiriKit to third-party developers for in-app integration of virtual voice assistant. Redesigned Apple Maps app with proactive assistance feature for route help and new extensions for third-party apps integration. Upgraded Photos App with smart scanner and finder functions. New Home App inclusion as stock application to replaced HomeKit App with advanced Home operating features. Improved Privacy to enhanced security for idevices with end-to-end encryption for iOS iMessage, FaceTime, and HomeKit apps. Redesigned Apple Music with revamped Radio, Library, Browse and For You tabs. Renewed Apple News App with the addition of Paid Subscriptions, For You section and Breaking News notifications. Enhanced iOS 10 User-Interface experience with new "Raise to Wake" feature and deeper 3D Touch Integration. Improved QuickType option with Siri support for fast typing. Advanced Phone App with the integrations of third-party VoIP calls, new caller ID extension for spam alerts and voicemail transcription support. Split-View Feature for Safari browser mainly for iPad devices. Improved Notes application with sharing support. Revamped Live Photos with editing and inbuilt stabilization functions. Apple Pay for websites on Safari web browser to pay online within apps. Delete Stock iOS Apps without Jailbreak. New Lock Screen with clear interface. Moved Widgets to Siri Search / Proactive Page from Notification Center today view section. Interactive Widgets powered by 3D Touch. New Interactive Notifications to view media and messages in notification panel. Apple iOS 10 firmware is compatible and supported by following iPhone, iPad and iPod touch devices officially. iOS 10 Final Version has been publicly available and released by Apple to all users from this year's Fall-2016 as free software update. Whereas iOS 10.3.3 Public Beta Version is now officially available from this month through Apple beta software program. Developer Preview iOS 10.3.3 Beta Version is available to all iOS developer program subscribers worldwide. 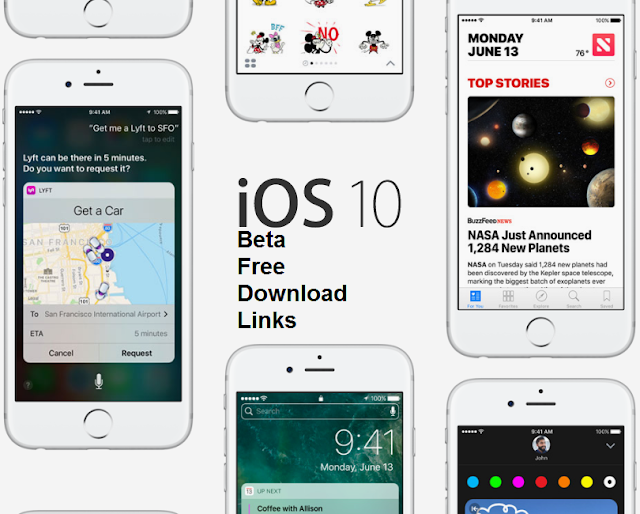 Apple iOS device users can free download, install and activate iOS 10.3.3 Beta without developer account and UDID (Apple ID) through iTunes. Just Download iOS 10.3.3 Beta .IPSW via Direct Links available below. Currently, No official iOS 10.3.3 Beta Jailbreak has been released from team TaiG, PanGu and 25PP Jailbreak tool developers. Minimum macOS El Capitan 10.11.5 installed. Enable Untrusted Enterprise Developer: Go to General >> Profile >> Accept the Apple Certificate. If incompatible internal file error occurs, try OTA Update (over-the-air).